For years people have been complaining that since the demise of the ISC there has been no peer-reviewed cryptozoological journal. So, three or four years ago I decided that we ought to start one, so I approached Dr Karl Shuker with the idea and the rest is history. As regular readers of my daily ramblings will know, Volume Three of the Journal of Cryptozoology came out earlier this week. They have sold out on Amazon already and will be having more copies in soon. However, if you want to buy it direct from us, you can get it at a special discounted price of £5.99 plus a quid's postage direct from www.journalofcryptozoology.com. C'mon guys, dig deep. I felt terrible when I woke up about two hours later than I should have done, but two large breakfasts and a healthy dose of the Sleaford Mods later, I am feeling far better than I have any right to do, and am actually rather enjoying today. 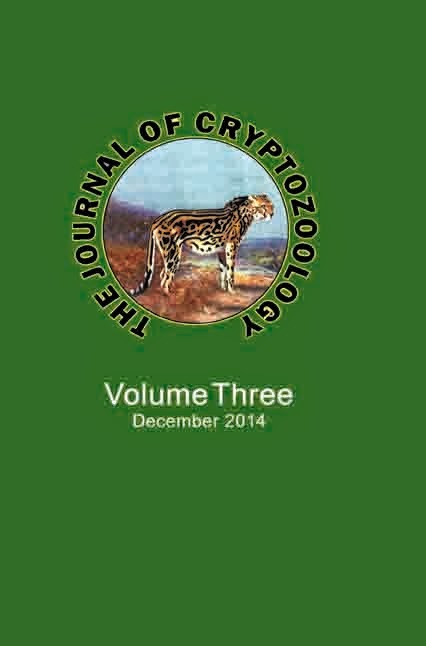 For years people have been complaining that since the demise of the ISC there has been no peer-reviewed cryptozoological journal. So, three or four years ago I decided that we ought to start one, so I approached Dr Karl Shuker with the idea and the rest is history. As regular readers of my daily ramblings will know, Volume Three of the Journal of Cryptozoology came out earlier this week. They have sold out on Amazon already and will be having more copies in soon. However, if you want to buy it direct from us, you can get it at a special discounted price of £5.99 plus a quid's postage direct from www.journalofcryptozoology.com. C'mon guys, dig deep. ON THIS DAY IN 1348 - The first English order of knighthood was founded. It was the Order of the Garter.